A weathered old oak tree points the way to the top of 3,576 foot Roxy Ann Peak. Lucky for us we didn’t begin at ground zero, but from the city of Medford, 2,200 feet below. Still, a good workout for our upcoming Italian trek. Warm temperatures, clear skies and the hope of spring wild flowers coaxed us out of the house for a return hike to the top of Lower Table Rock. 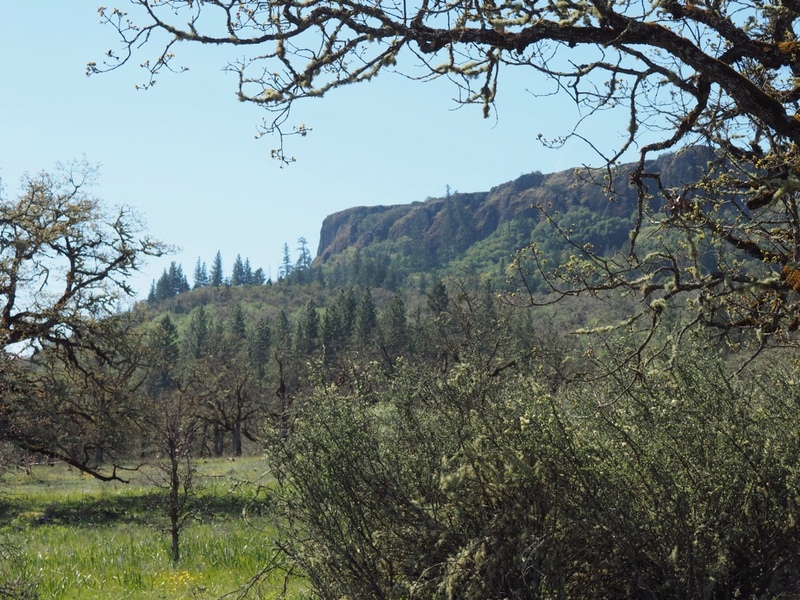 This geologic wonder, along with neighboring Upper Table Rock, is located just outside of Medford, Oregon, an easy drive from Ashland. Both are remnants of a 7 million year old lava flow that made its way down the Rogue River. Erosion has led to the two mesas we see today. Lower Table Rock looms 800 feet above the valley. Trails lead to the top of both mesas, but we chose the longer Lower Table Rock trail. Summer sun can be brutal, so spring is prime hiking season. Trees were beginning to leaf out and wild flowers lined the trail along the way. Once we reached the top, the trail followed what was once a grassy airstrip…where brave pilots would have experienced a mighty bumpy landing. Vernal pools border the trail in early spring and are considered micro-ecosystems. The ponds support a federally protected species of fairy shrimp and a state endangered plant called Dwarf Wooly Meadowfoam, a plant found nowhere else in the world. 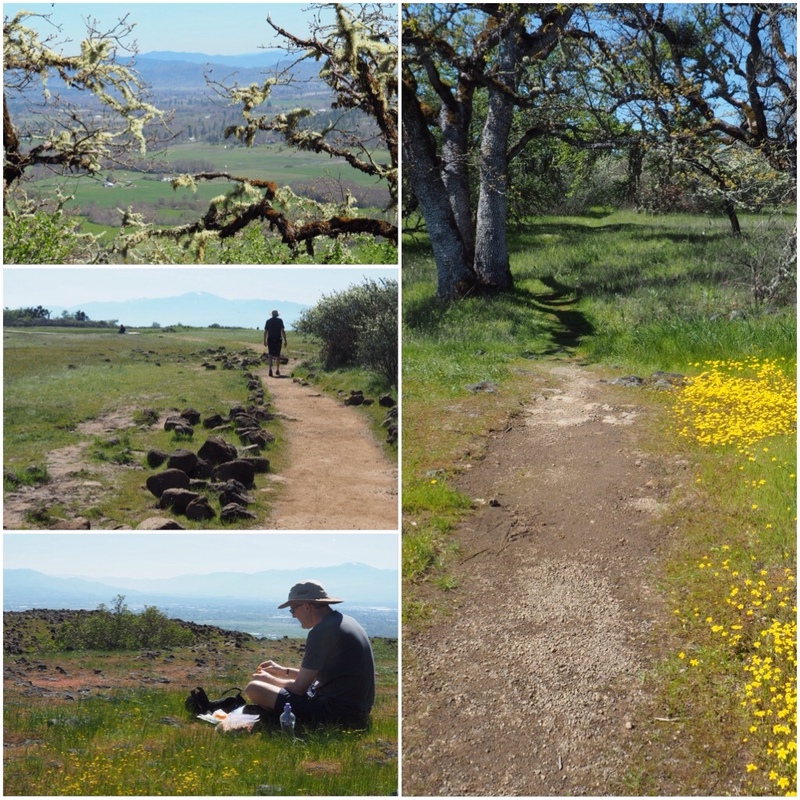 If you're in the area and looking for an easily accessible day hike then Lower Table Rock is tough to beat. Be sure to take along water and a picnic lunch. Find a spot to relax and enjoy the views…they are spectacular! Spring was bursting as we hiked the 5.2 mile round trip. The view from the top with Mt. McLoughlin in the distance.